Mol. Cells. Mar 31, 2017; 40(3): 169-177. Tissue-specific transcription is critical for normal development, and abnormalities causing undesirable gene expression may lead to diseases such as cancer. Such highly organized transcription is controlled by enhancers with specific DNA sequences recognized by transcription factors. Enhancers are associated with chromatin modifications that are distinct epigenetic features in a tissue-specific manner. Recently, super-enhancers comprising enhancer clusters co-occupied by lineage-specific factors have been identified in diverse cell types such as adipocytes, hair follicle stem cells, and mammary epithelial cells. In addition, noncoding RNAs, named eRNAs, are synthesized at super-enhancer regions before their target genes are transcribed. Many functional studies revealed that super-enhancers and eRNAs are essential for the regulation of tissue-specific gene expression. In this review, we summarize recent findings concerning enhancer function in tissue-specific gene regulation and cancer development. Although all different types of human cells share the same genome, their gene expression is spatially and temporally distinct. Establishing a tissue-specific transcriptional program during development is required for the unique function of each tissue. Enhancers are key regulatory elements that control this process. They consist of short DNA regions, usually located far from gene promoters, can be occupied by co-activators and other transcription factors, and function as cis-regulatory elements. Epigenetic modifications such as DNA methylation (King et al., 2016) and histone modification can regulate enhancers (King et al., 2016; Shlyueva et al., 2014). The current advances in high-throughput sequencing allow us to explore the relationship between enhancer activity and epigenetic changes at enhancer regions in the mammalian genome. With these powerful technologies, it is possible to distinguish between active and inactive enhancers, based on histone modifications such as H3K4me1 and H3K27ac (Creyghton et al., 2010). Moreover, the concept of super-enhancers, comprising multiple individual enhancers within a certain region, has been introduced to describe influential regulatory elements that control tissue-specific transcription (Gosselin et al., 2014; Huang et al., 2016; Siersbaek et al., 2014; Whyte et al., 2013). Each individual constituent enhancer of the super-enhancer binds tissue-enriched and lineage-specific transcription factors. For example, in the mammary epithelium, mammary-specific super-enhancers were identified with mammary-enriched transcription factors, such as signal transducer and activator of transcription 5 (STAT5), glucocorticoid receptor (GR), E74 like ETS transcription factor 5 (ELF5), and nuclear factor I B (NFIB), and the active enhancer marker, H3K27ac (Shin et al., 2016). Genes associated with mammary-specific super-enhancers were significantly expressed as these super-enhancers were progressively assembled during pregnancy. Furthermore, recent studies have shown that enhancer RNAs (eRNAs) are synthesized at super-enhancer regions (Pefanis et al., 2015; Schmidt et al., 2015). Their function is still not clear, but they are involved in chromatin loop formation for promoter-enhancer interactions (Beagrie and Pombo, 2016). Functional studies of these regulatory elements can help us understand diseases such as cancer, since pathogenic super-enhancers and aberrant eRNA regulation have been identified in tumorigenesis. Herein, we describe recent advances in our understanding of enhancer function during development and disease. Although the role of individual enhancers in cell-type specific gene expression has been studied for a long time, it is only recently that genome-wide analysis has allowed the identification of all enhancers in the mammalian genome. This was achieved by using various histone markers that recognize enhancer regions, as well as the development of whole-genome sequencing techniques (Heintzman et al., 2009; Hon et al., 2009; Shlyueva et al., 2014). 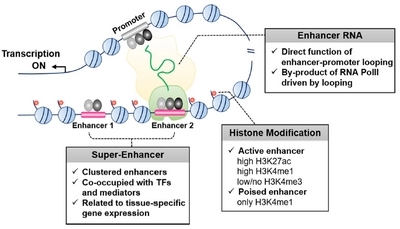 Enhancers are mainly enriched with H3K4me1 and H3K27ac, and do not contain H3K4me3 as a promoter marker, but H3K27ac-enriched enhancers in the active state can be distinguished from poised enhancers occupied with H3K4me1 only (Fig. 1). Poised enhancers are not yet functionally active; however, enrichment in the H3K27ac marker could be observed since they are active to regulate target gene expression. Global analyses by ChIP-seq to detect lineage-specific transcription factors and histone modification markers identified enhancer clusters known as super-enhancers, which are located close to each other in the genome (Fig. 1) (Chapuy et al., 2013; Hnisz et al., 2013; Kitagawa et al., 2017; Le Noir et al., 2017; Liang et al., 2016; Loven et al., 2013; Niederriter et al., 2015; Shin et al., 2016; Teppo et al., 2016; Whyte et al., 2013). 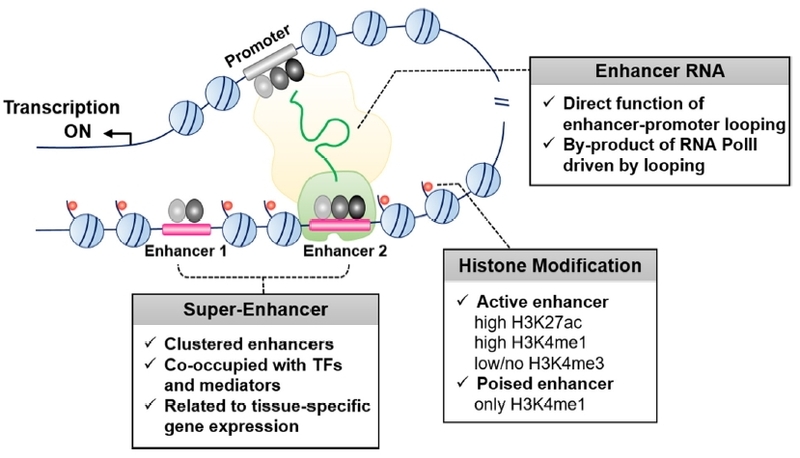 Super-enhancers contain multiple hotspots co-occupied by lineage-specific transcription factors and mediators within a certain region, which typically spans tens of kilobases covered with extended histone modification markers of active enhancers. Therefore, H3K27ac and MED1, lineage-specific factors, are commonly used to identify tissue-specific super-enhancers; combinations of transcription factors and H3K27ac are also used for advanced analysis. Super-enhancers control tissue-specific gene regulation in mouse stem cells, hair follicle stem cells, macrophages, adipocytes, and mammary epithelium (Adam et al., 2015; Gosselin et al., 2014; Shin et al., 2016; Siersbaek et al., 2014; Whyte et al., 2013). Several key features enable super-enhancers to regulate tissue-specific gene expression. First, genes associated with super-enhancers are expressed at higher levels than genes associated with typical enhancers, which are single enhancer regions controlling target gene expression. For example, in mouse embryonic stem cells, super-enhancers were found to regulate the key regulatory transcription factors Oct4, Sox2, and Nanog, which were ranked based on MED1 signals (Whyte et al., 2013). The expression of genes associated with super-enhancers such as Klf4 and Esrrb, which play important roles in cell identity, was significantly higher than that of typical enhancer-associated genes in mouse embryonic stem cells. Similar findings were observed in human stem cells, T cells, and chondrocytes (Huang et al., 2016; Liu and Lefebvre, 2015; Ohba et al., 2015; Vahedi et al., 2015). Moreover, comparison analysis of various tissues showed that super-enhancer-associated genes are highly expressed in a tissue-specific manner. This suggests that super-enhancers act more powerfully on tissue-specific gene expression compared to typical enhancers. Second, super-enhancers are sensitive to environmental changes. The establishment of super-enhancers was shown to be affected by environmental conditions, such as hormones during development in hair follicle stem cells, macrophages and mammary gland (Adam et al., 2015; Gosselin et al., 2014; Shin et al., 2016). Additionally, super-enhancers were dynamically remodeled by the microenvironment in the wound-repair of hair follicle stem cells, and mammary-specific super-enhancers were progressively assembled during pregnancy when prolactin secretion was increased. In addition, some specific enhancers were immediately switched off when prolactin secretion was reduced (Willi et al., 2016), suggesting that super-enhancers are sensitive to perturbations. Finally, individual enhancers consisting of super-enhancers have their own unique functions. Loss of function studies using genome editing tools such as CRISPR/Cas9 revealed the biological functions of each enhancer in a super-enhancer (Huang et al., 2016; Shin et al., 2016). One of these acts as an epicentric enhancer of a super-enhancer and differs in reactivity in the presence of different transcription factors, affecting the expression of the target gene more strongly (Adam et al., 2015; Shin et al., 2016). This suggests that super-enhancers, which are formed in a dense form of enhancers with different functions, play important roles in regulating tissue-specific gene regulation. Determination of the molecular mechanism of long noncoding RNA (Mattick and Makunin, 2006), identification of enhancer RNA (eRNA), and bi-directionally transcribed RNA in enhancer regions (Andersson et al., 2014; Kim et al., 2010; Lam et al., 2014; Murakawa et al., 2016), raised questions regarding enhancer establishment, enhancer target-gene regulation, and chromosome looping structure (Cheng et al., 2015; Kaikkonen et al., 2013; Kim et al., 2010; Li et al., 2013; 2015; Mousavi et al., 2013; Pnueli et al., 2015; Schaukowitch et al., 2014; Shibayama et al., 2014; Wu et al., 2014). Global run-on sequencing (GRO-seq) and total RNA-seq are typically applied to identify global eRNAs in the whole genome. Although eRNA is not essential for all enhancers, it affects the regulation of active-enhancer transcription for gene expression (Cheng et al., 2015; Kim et al., 2010). Moreover, it was previously shown that eRNA affects cell-type-specific transcriptional regulation (Mousavi et al., 2013; Wu et al., 2014). eRNA is thought to function in enhancer–promoter interactions directly or indirectly to regulate gene expression by transcription pre-initiation complexes RNA pol II, DNA- and RNA-binding transcription factor, or co-factor of DNA- and RNA-binding transcription factor (Fig. 1) (Andersson, 2015; Beagrie and Pombo, 2016; Li et al., 2016). The formation of genomic looping structures, where enhancers interact with promoters, require an eRNA, mediator, and cohesion (Fig. 1) (Shibayama et al., 2014). However, it has recently been reported that eRNA could be a byproduct of the co-occupation of RNA PolII driven by enhancer-promoter looping (Kron et al., 2014). The function of eRNA during chromatin looping is still unknown, and further studies on the topic are required. A previous study reported a correlation between super-enhancers and eRNA, which also coordinated collective transcription factor binding (Hah et al., 2015). Even though not all eRNAs were expressed at super-enhancer regions, both super-enhancers and eRNA were affected by genomic damage (Qian et al., 2014). Genomic instability can influence the super-enhancer establishment and eRNA expression and as a result, it could affect gene expression. In B cells, many super-enhancers contained activation-induced cytidine deaminase (AID) sequences, even for non-AID target genes. Consequently, AID-induced damage of enhancer regions could affect B cell function. Additionally, it could control chromatin looping by damaging regions involved in promoter-enhancer interactions (Qian et al., 2014). A correlation between loss or gain of super-enhancer formation and eRNA expression was clearly observed (Hah et al., 2015; Schmidt et al., 2015). Hah et al. (Hah et al., 2015) observed that during toll-like receptor 4 (TLR4) signaling in macrophages, ~93% of intergenic super-enhancers were associated with eRNAs, whereas only ~30% of intergenic typical enhancers were associated with eRNAs, suggesting a correlation between super-enhancer formation and eRNA transcription. Accordingly, in those intergenic super-enhancer regions, tissue-specific transcription factor binding and gene expression were much higher. It is possible that eRNA expression in super-enhancers controls transcription factor binding and consequently, regulates inflammatory gene expression. Interestingly, it also has been found that some lncRNAs called x-eRNA were targeted by the RNA exosome at super-enhancers (Pefanis et al., 2015). Since eRNAs generate complexes with single-stranded DNA for protection from genomic instability by the rapid degradation activity of the RNA exosome complex, it could be suggested that super-enhancers might be connected with their target genes through RNA exosome-mediated transcription regulation. However, it is unclear whether the mechanism is dependent on direct RNA-protein complex at enhancer-promoter interaction yet. Cancer-related super-enhancers were found in various cancers such as colorectal cancer, small cell lung cancer, T cell acute lymphoblastic leukemia, and acute myeloid leukemia (Christensen et al., 2014; Hnisz et al., 2015; Mansour et al., 2014; Pelish et al., 2015). Among the many cancer-related super-enhancers, those related to the MYC proto-oncogene and frequently hyperactivated in many cancer types (Dang, 2012; Felsher et al., 2000; Gabay et al., 2014; Hsieh et al., 2015; Shou et al., 2000) have been well-defined (Affer et al., 2014; Herranz et al., 2014; Liang et al., 2016; Wei et al., 2016). 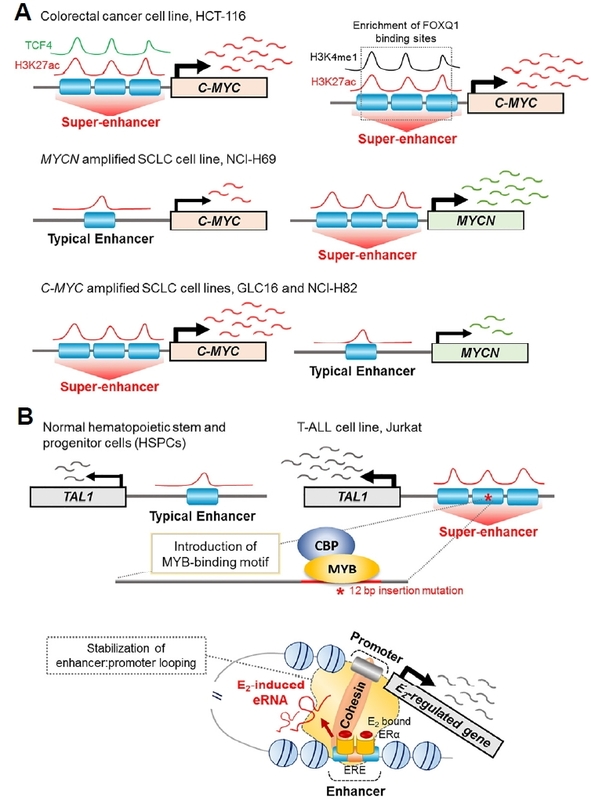 Interestingly, although super-enhancers at the MYC locus are common in most cancers, super-enhancers at this region undergo a different regulatory mechanism depending on the cancer type (Fig. 2A) (Christensen et al., 2014; Hnisz et al., 2015). In the colorectal cancer cell line HCT-116, the super-enhancer region co-occupied with TCF4, and H3K27ac was observed at the c-MYC oncogene locus (Fig. 2A) (Hnisz et al., 2015), which is a target of Wnt signaling (Zhang et al., 2012). This resulted in significantly higher expression of c-MYC in colorectal cancer cells, suggesting that this super-enhancer controls the oncogenic pathway (Hnisz et al., 2015). Moreover, Heyn et al. (2016) detected aberrant DNA methylation patterns on super-enhancers in HCT-116 cells, specifically, hypomethylation at super-enhancers regions of the MYC (Fig. 2A) and ring finger protein 43 (RNF43) oncogenes. Enrichment of forkhead box Q1 (FOXQ1) transcription factor binding sites was detected in hypomethylated super-enhancer regions of MYC (Fig. 2A) and RNF43, demonstrating that hypomethylated regions at colorectal cancer-specific super-enhancers are abundantly occupied by oncogenic transcription factors (Heyn et al., 2016). Christensen et al. identified specific super-enhancers in the small cell lung cancer (SCLC) cell lines NCI-H69, GLC16, and NCI-H82 (Christensen et al., 2014). Consistent with the results of a previous study suggesting differential gene expression profiles between ‘classical’ NCI-H69 and GLC16, and ‘variant’ NCI-H82 SCLC cell lines (Pedersen et al., 2003), the classical cell lines showed similar super-enhancer associated gene profiles, whereas the variant cell line showed a different profile from that of the classical cell lines. Moreover, the existence of specific super-enhancers regulated independently by different SCLC cancer cell types has been elucidated at the region of the MYC gene family (Fig. 2A) (Christensen et al., 2014). These studies suggest that enhancer identification in SCLC models is important to understand SCLC pathogenesis and the specific characteristics of the disease. The transcriptional regulatory mechanism of the TAL1 oncogene was identified in T cell acute lymphoblastic leukemia (T-ALL) (Mansour et al., 2014). ChIP-seq analysis of H3K27ac indicated H3K27ac enrichment upstream of the transcription start site of the TAL1 gene in Jurkat T-ALL cells (Fig. 2B). Additionally, this region possessed a heterozygous 12-bp insertion that introduced a de novo myeloblastosis oncogene (MYB) transcription factor binding motif, which recruited MYB and H3K27 acetylase-binding CREB-binding protein (CBP), increasing TAL1 expression (Mansour et al., 2014) (Fig. 2B). Interestingly, deletion of an inserted mutation of the TAL1 enhancer reduced endogenous TAL1 expression levels through the collapse of the TAL1 super-enhancer in Jurkat cells (Mansour et al., 2014), indicating that epigenetic regulators, including super-enhancers, act as master regulators to mediate gene expression. Taken together, these results suggest that intergenic mutations of noncoding elements create binding sites for master regulators and generate oncogenic super-enhancers in T-ALL cells, and identification of the mechanism of aberrant super-enhancer formation would provide insight for studies of novel therapeutic strategies in cancer (Mansour et al., 2014). Pelish et al. identified mediator-associated cyclin-dependent kinase 8 (CDK8) as a negative regulator of super-enhancer associated transcription in acute myeloid leukemia (AML) cells (Pelish et al., 2015). ChIP-seq binding profiles at putative enhancer elements of CCAAT/enhancer binding protein, alpha (CEBPA) showed that CDK8 most closely related to MED1, followed by BRD4 and H3K27ac (Pelish et al., 2015). Furthermore, treatment with cortistatin A (CA), which inhibits mediator kinases including CDK8, increased the expression of tumor suppressor genes regulated by super-enhancers and inhibited AML progression in a xenograft model, suggesting that mediator-associated kinases can act as negative regulators of genes regulated by super-enhancers (Pelish et al., 2015). eRNAs are transcribed from enhancer regions, but their role in regulating enhancer activity remains unknown. Li et al. (2013) performed global run-on sequencing (GRO-seq) in 17β-estradiol (E2)-treated human breast cancer cell line. They identified that E2-associated enhancers induced eRNA transcription from enhancers adjacent to E2-activated genes, and that knockdown of FOXC1, trefoil factor 1 (TFF1), or carbonic anhydrase 12 (CA12) eRNA reduced transcription of the adjacent coding genes but not of coding genes located distally to the corresponding enhancers (Li et al., 2013). Moreover, they provided evidence that E2-induced eRNA enhanced the strength of specific enhancer-promoter looping (Fig. 2C) (Li et al., 2013), demonstrating the important role of eRNA in controlling ligand-dependent target gene transcription and enhancer activity. Another group studied estrogen-mediated eRNAs at estrogen receptor (ESR1) binding sites (ERBSs) by novel computational methods, and found that eRNA transcription from ERBSs strongly correlated with promoter-enhancer looping in the target gene (Hah et al., 2013). However, Hah et al. showed that inhibition of E2-induced eRNA production did not affect ESR1 enhancer assembly at ERBSs, despite the existence of a positive correlation between eRNA production and enhancer activity, suggesting that eRNA in MCF-7 cells is produced after active chromatin loop formation (Hah et al., 2013; Kron et al., 2014). eRNA transcription in human breast cancer is induced not only by estrogen but also by nutlin-3a, an activator of p53 (Leveille et al., 2015). Leveille et al. (2015) performed GRO-seq in MCF-7 cells treated with nutlin-3a to identify p53-regulated eRNAs and their role in p53-regulated enhancer activation. They discovered that lncRNA activator of enhancer domains (LED) is a p53-induced target, which binds to p53-regulated enhancer regions, inducing transcription of eRNA, such as P21, TOB1, PRKAG2, and SUFU (Leveille et al., 2015). Interestingly, a hypermethylated promoter region in LED was observed in human tumors, indicating that LED silencing is involved in cancer pathogenesis (Leveille et al., 2015). Increased androgen receptor (AR) expression is critical for castration-resistant prostate cancer (CRPC) progression (van der Steen et al., 2013). Therefore, it is important to elucidate the AR regulatory mechanism. Zhao et al. (2016) identified a group of AR-regulated enhancer RNAs (AR-eRNAs) in CRPC cells, including the PSA eRNA, which was increased in CRPC, could bind to CYCLIN T1 and activate the P-TEFb complex, leading to increased Pol II-Ser2 phosphorylation (Polll-Ser2p) at both cis and trans targets. Furthermore, they demonstrated that PSA eRNA knockdown reduced CRPC cell growth, suggesting that eRNA may be a potential therapeutic target in CRPC (Zhao et al., 2016). The same research group has also reported that enzalutamide, a competitive AR inhibitor, altered AR-eRNA production in CRPC cells (Zhao et al., 2016). They identified differentially regulated AR-eRNAs in cells sensitive or resistant to enzalutamide, and revealed that FTO, LUZP2, MARC1, and NCAM2 regulation may be related to enzalutamide resistance (Zhao et al., 2016). These results suggest that profiling eRNA alterations is a useful approach to understand the role of eRNA in enzalutamide resistance and to identify novel therapeutic targets for curing CRPC. As described above, dysregulated super-enhancers and eR-NAs are closely related to cancer development, hence, the therapeutic effects of targeting aberrant super-enhancers or eRNAs have been studied (Table 2). Yokoyama et al. provided evidence suggesting that epigenetic regulators may be used as therapeutic targets in epithelial ovarian cancer (EOC) stem-like cells (CSCs) characterized by increased aldehyde dehydrogenase (ALDH) activity (Landen et al., 2010; Steg et al., 2012; Yokoyama et al., 2016). Because increased ALDH activity enhances stem-related gene expression and chemotherapy resistance in EOC (Landen et al., 2010), therapeutic strategies targeting ALDH are important. Yokoyama et al. showed that the bromodomain and extraterminal (BET) inhibitor JQ1 suppressed ALDH1A1 expression by influencing the BRD4-regulated super-enhancer and its associated eRNA (Yokoyama et al., 2016). Furthermore, combination treatment with JQ1 and cisplatin reduced tumor size, implying that regulating super-enhancer or eRNAs can be a future therapeutic strategy against ovarian cancer. Jiang et al. (2016) found that the known small-molecule specific CDK7 inhibitor THZ1 is a potent drug against oesophageal squamous cell carcinoma (OSCC). THZ1 injection reduced OSCC tumor weight and distal OCSS cell metastasis to the lungs (Jiang et al., 2016). Interestingly, treatment with low THZ1 doses decreased the levels of oncogenic transcripts, such as runt related transcription factor 1 (RUNX1), yes-associated protein 1 (YAP1), DnaJ heat shock protein family member B1 (DNAJB1), sterol regulatory element binding transcription factor 2 (SREBF2), and p21 activated kinase 4 (PAK4), which were associated with super-enhancers (Jiang et al., 2016). Indeed, YAP1, SREBF2, and PAK4 were highly expressed in OSCC (Jiang et al., 2016). Moreover, Jiang et al. identified that administration of a novel PAK4 inhibitor effectively suppressed tumor growth in OSCC xenograft models (Jiang et al., 2016), demonstrating the merit of targeting super-enhancer-associated oncogenic transcripts for anti-OSCC treatment (Jiang et al., 2016). Despite massive efforts to study the function of enhancers, our overall understanding of how enhancers regulate tissue-specific gene expression was limited. The development of high-throughput sequencing technologies allowed the identification of complete transcription factor landscapes and histone modification marks in the whole genome. Comparative analysis between various tissues can lead to a comprehensive understanding of enhancers as master regulators during development. Numerous ChIP-seq data, describing enhancer epigenetic features in a tissue-specific manner, suggest that super-enhancers are involved in tissue-specific gene regulation. Functional studies through CRISPR/Cas9 revealed that individual enhancer elements in super-enhancers have unique functions. The next question to be considered is which elements are required to maintain the unique functions of enhancers, and further research is required to show whether enhancer functions are determined by the DNA sequence itself or the structure of the super-enhancer unit. Enhancers recruit transcription factors and mediators, but this might not be sufficient to enhance target gene expression. Many enhancers are co-occupied by RNA Pol II, leading to eRNA transcription. eRNA plays a role in enhancing target gene expression through the formation of enhancer-promoter looping. The mechanisms underlying eRNA function are not yet clear, but aberrant eRNAs have been identified during tumorigenesis, suggesting that epi-genetic regulators could be potential therapeutic targets. Mol. Cells.Mar 31, 2017; 40(3): 169-177. Received March 5, 2017; Accepted March 30, 2017. Adam, R.C., Yang, H., Rockowitz, S., Larsen, S.B., Nikolova, M., Oristian, D.S., Polak, L., Kadaja, M., Asare, A., and Zheng, D. (2015). Pioneer factors govern super-enhancer dynamics in stem cell plasticity and lineage choice. Nature. 521, 366-370. Affer, M., Chesi, M., Chen, W.D., Keats, J.J., Demchenko, Y.N., Tamizhmani, K., Garbitt, V.M., Riggs, D.L., Brents, L.A., and Roschke, A.V. (2014). 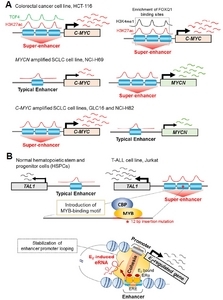 Promiscuous MYC locus rearrangements hijack enhancers but mostly super-enhancers to dysregulate MYC expression in multiple myeloma. Leukemia. 28, 1725-1735. Andersson, R. (2015). Promoter or enhancer, what’s the difference? Deconstruction of established distinctions and presentation of a unifying model. Bioessays. 37, 314-323. Andersson, R., Gebhard, C., Miguel-Escalada, I., Hoof, I., Bornholdt, J., Boyd, M., Chen, Y., Zhao, X., Schmidl, C., and Suzuki, T. (2014). An atlas of active enhancers across human cell types and tissues. Nature. 507, 455-461. Beagrie, R.A., and Pombo, A. (2016). Gene activation by metazoan enhancers: Diverse mechanisms stimulate distinct steps of transcription. Bioessays. 38, 881-893. Chapuy, B., McKeown, M.R., Lin, C.Y., Monti, S., Roemer, M.G., Qi, J., Rahl, P.B., Sun, H.H., Yeda, K.T., and Doench, J.G. (2013). Discovery and characterization of super-enhancer-associated dependencies in diffuse large B cell lymphoma. Cancer Cell. 24, 777-790. Cheng, J.H., Pan, D.Z., Tsai, Z.T., and Tsai, H.K. (2015). Genome-wide analysis of enhancer RNA in gene regulation across 12 mouse tissues. Sci Rep. 5, 12648. Christensen, C.L., Kwiatkowski, N., Abraham, B.J., Carretero, J., Al-Shahrour, F., Zhang, T., Chipumuro, E., Herter-Sprie, G.S., Akbay, E.A., and Altabef, A. (2014). Targeting transcriptional addictions in small cell lung cancer with a covalent CDK7 inhibitor. Cancer Cell. 26, 909-922. Creyghton, M.P., Cheng, A.W., Welstead, G.G., Kooistra, T., Carey, B.W., Steine, E.J., Hanna, J., Lodato, M.A., Frampton, G.M., and Sharp, P.A. (2010). Histone H3K27ac separates active from poised enhancers and predicts developmental state. Proc Natl Acad Sci USA. 107, 21931-21936. Dang, C.V. (2012). MYC on the path to cancer. Cell. 149, 22-35. Felsher, D.W., Zetterberg, A., Zhu, J., Tlsty, T., and Bishop, J.M. (2000). Overexpression of MYC causes p53-dependent G2 arrest of normal fibroblasts. Proc Natl Acad Sci USA. 97, 10544-10548. Gabay, M., Li, Y., and Felsher, D.W. (2014). MYC activation is a hallmark of cancer initiation and maintenance. Cold Spring Harb Perspect Med. 4, . Gosselin, D., Link, V.M., Romanoski, C.E., Fonseca, G.J., Eichenfield, D.Z., Spann, N.J., Stender, J.D., Chun, H.B., Garner, H., and Geissmann, F. (2014). Environment drives selection and function of enhancers controlling tissue-specific macrophage identities. Cell. 159, 1327-1340. Hah, N., Murakami, S., Nagari, A., Danko, C.G., and Kraus, W.L. (2013). Enhancer transcripts mark active estrogen receptor binding sites. Genome Res. 23, 1210-1223. Hah, N., Benner, C., Chong, L.W., Yu, R.T., Downes, M., and Evans, R.M. (2015). Inflammation-sensitive super enhancers form domains of coordinately regulated enhancer RNAs. Proc Natl Acad Sci USA. 112, E297-302. Heintzman, N.D., Murakami, S., Nagari, A., Danko, C.G., and Kraus, W.L. (2009). Histone modifications at human enhancers reflect global cell-type-specific gene expression. Nature. 459, 108-112. Herranz, D., Ambesi-Impiombato, A., Palomero, T., Schnell, S.A., Belver, L., Wendorff, A.A., Xu, L., Castillo-Martin, M., Llobet-Navás, D., and Cordon-Cardo, C. (2014). A NOTCH1-driven MYC enhancer promotes T cell development, transformation and acute lymphoblastic leukemia. Nat Med. 20, 1130-1137. Heyn, H., Vidal, E., Ferreira, H.J., Vizoso, M., Sayols, S., Gomez, A., Moran, S., Boque-Sastre, R., Guil, S., and Martinez-Cardus, A. (2016). Epigenomic analysis detects aberrant super-enhancer DNA methylation in human cancer. Genome Biol. 17, 11. Hnisz, D., Abraham, B.J., Lee, T.I., Lau, A., Saint-André, V., Sigova, A.A., Hoke, H.A., and Young, R.A. (2013). Super-enhancers in the control of cell identity and disease. Cell. 155, 934-947. Hnisz, D., Schuijers, J., Lin, C.Y., Weintraub, A.S., Abraham, B.J., Lee, T.I., Bradner, J.E., and Young, R.A. (2015). Convergence of developmental and oncogenic signaling pathways at transcriptional super-enhancers. Mol Cell. 58, 362-370. Hon, G.C., Hawkins, R.D., and Ren, B. (2009). Predictive chromatin signatures in the mammalian genome. Hum Mol Genet. 18, R195-201. Hsieh, A.L., Walton, Z.E., Altman, B.J., Stine, Z.E., and Dang, C.V. (2015). MYC and metabolism on the path to cancer. Semin Cell Dev Biol. 43, 11-21. Huang, J., Liu, X., Li, D., Shao, Z., Cao, H., Zhang, Y., Trompouki, E., Bowman, T.V., Zon, L.I., and Yuan, G.C. (2016). Dynamic control of enhancer repertoires drives lineage and stage-specific transcription during hematopoiesis. Dev Cell. 36, 9-23. Jiang, Y.Y., Lin, D.C., Mayakonda, A., Hazawa, M., Ding, L.W., Chien, W.W., Xu, L., Chen, Y., Xiao, J.F., and Senapedis, W. (2016). Targeting super-enhancer-associated oncogenes in oesophageal squamous cell carcinoma. Gut. , . Kaikkonen, M.U., Lin, D.C., Mayakonda, A., Hazawa, M., Ding, L.W., Chien, W.W., Xu, L., Chen, Y., Xiao, J.F., and Senapedis, W. (2013). Remodeling of the enhancer landscape during macrophage activation is coupled to enhancer transcription. Mol Cell. 51, 310-325. Kim, T.K., Hemberg, M., Gray, J.M., Costa, A.M., Bear, D.M., Wu, J., Harmin, D.A., Laptewicz, M., Barbara-Haley, K., and Kuersten, S. (2010). Widespread transcription at neuronal activity-regulated enhancers. Nature. 465, 182-187. King, A.D., Hemberg, M., Gray, J.M., Costa, A.M., Bear, D.M., Wu, J., Harmin, D.A., Laptewicz, M., Barbara-Haley, K., and Kuersten, S. (2016). Reversible regulation of promoter and enhancer histone landscape by DNA methylation in mouse embryonic stem cells. Cell Rep. 17, 289-302. Kitagawa, Y., Ohkura, N., Kidani, Y., Vandenbon, A., Hirota, K., Kawakami, R., Yasuda, K., Motooka, D., Nakamura, S., and Kondo, M. (2017). Guidance of regulatory T cell development by Satb1-dependent super-enhancer establishment. Nat Immunol. 18, 173-183. Kron, K.J., Bailey, S.D., and Lupien, M. (2014). Enhancer alterations in cancer: a source for a cell identity crisis. Genome Med. 6, 77. Lam, M.T., Li, W., Rosenfeld, M.G., and Glass, C.K. (2014). Enhancer RNAs and regulated transcriptional programs. Trends Biochem Sci. 39, 170-182. Landen, C.N., Goodman, B., Katre, A.A., Steg, A.D., Nick, A.M., Stone, R.L., Miller, L.D., Mejia, P.V., Jennings, N.B., and Gershenson, D.M. (2010). Targeting aldehyde dehydrogenase cancer stem cells in ovarian cancer. Mol Cancer Ther. 9, 3186-3199. Le Noir, S., Laffleur, B., Carrion, C., Garot, A., Lecardeur, S., Pinaud, E., Denizot, Y., Skok, J., and Cogné, M. (2017). The IgH locus 3′ cis-regulatory super-enhancer co-opts AID for allelic transvection. Oncotarget. , . Leveille, N., Melo, C.A., Rooijers, K., Díaz-Lagares, A., Melo, S.A., Korkmaz, G., Lopes, R., Akbari Moqadam, F., Maia, A.R., and Wijchers, P.J. (2015). Genome-wide profiling of p53-regulated enhancer RNAs uncovers a subset of enhancers controlled by a lncRNA. Nat Commun. 6, 6520. Li, W., Notani, D., Ma, Q., Tanasa, B., Nunez, E., Chen, A.Y., Merkurjev, D., Zhang, J., Ohgi, K., and Song, X. (2013). Functional roles of enhancer RNAs for oestrogen-dependent transcriptional activation. Nature. 498, 516-520. Li, W., Hu, Y., Oh, S., Ma, Q., Merkurjev, D., Song, X., Zhou, X., Liu, Z., Tanasa, B., and He, X. (2015). Condensin I and II complexes license full estrogen receptor alpha-dependent enhancer activation. Mol Cell. 59, 188-202. Li, W., Notani, D., and Rosenfeld, M.G. (2016). Enhancers as non-coding RNA transcription units: recent insights and future perspectives. Nat Rev Genet. 17, 207-223. Liang, J., Zhou, H., Gerdt, C., Tan, M., Colson, T., Kaye, K.M., Kieff, E., and Zhao, B. (2016). Epstein-Barr virus super-enhancer eRNAs are essential for MYC oncogene expression and lymphoblast proliferation. Proc Natl Acad Sci USA. 113, 14121-14126. Liu, C.F., and Lefebvre, V. (2015). The transcription factors SOX9 and SOX5/SOX6 cooperate genome-wide through super-enhancers to drive chondrogenesis. Nucleic Acids Res. 43, 8183-8203. Loven, J., Hoke, H.A., Lin, C.Y., Lau, A., Orlando, D.A., Vakoc, C.R., Bradner, J.E., Lee, T.I., and Young, R.A. (2013). Selective inhibition of tumor oncogenes by disruption of super-enhancers. Cell. 153, 320-334. Mansour, M.R., Abraham, B.J., Anders, L., Berezovskaya, A., Gutierrez, A., Durbin, A.D., Etchin, J., Lawton, L., Sallan, S.E., and Silverman, L.B. (2014). Oncogene regulation. An oncogenic super-enhancer formed through somatic mutation of a noncoding intergenic element. Science. 346, 1373-1377. Mattick, J.S., and Makunin, I.V. (2006). Non-coding RNA. Hum Mol Genet. 15, R17-29. Mousavi, K., Zare, H., Dell’orso, S., Grontved, L., Gutierrez-Cruz, G., Derfoul, A., Hager, G.L., and Sartorelli, V. (2013). eRNAs promote transcription by establishing chromatin accessibility at defined genomic loci. Mol Cell. 51, 606-617.
, (2016). Enhanced identification of transcriptional enhancers provides mechanistic insights into diseases. Trends Genet. 32, 76-88. Niederriter, A.R., Varshney, A., Parker, S.C., and Martin, D.M. (2015). Super enhancers in cancers, complex disease, and developmental disorders. Genes (Basel). 6, 1183-1200. Ohba, S., He, X., Hojo, H., and McMahon, A.P. (2015). Distinct transcriptional programs underlie Sox9 regulation of the mammalian chondrocyte. Cell Rep. 12, 229-243. Pedersen, N., Mortensen, S., S⊘rensen, S.B., Pedersen, M.W., Rieneck, K., Bovin, L.F., and Poulsen, H.S. (2003). Transcriptional gene expression profiling of small cell lung cancer cells. Cancer Res. 63, 1943-1953. Pefanis, E., Wang, J., Rothschild, G., Lim, J., Kazadi, D., Sun, J., Federation, A., Chao, J., Elliott, O., and Liu, Z.P. (2015). RNA exosome-regulated long non-coding RNA transcription controls super-enhancer activity. Cell. 161, 774-789. Pelish, H.E., Liau, B.B., Nitulescu, I.I., Tangpeerachaikul, A., Poss, Z.C., Da Silva, D.H., Caruso, B.T., Arefolov, A., Fadeyi, O., and Christie, A.L. (2015). Mediator kinase inhibition further activates super-enhancer-associated genes in AML. Nature. 526, 273-276. Pnueli, L., Rudnizky, S., Yosefzon, Y., and Melamed, P. (2015). RNA transcribed from a distal enhancer is required for activating the chromatin at the promoter of the gonadotropin alpha-subunit gene. Proc Natl Acad Sci USA. 112, 4369-4374. Pott, S., and Lieb, J.D. (2015). What are super-enhancers? Nat. Genet. 47, 8-12. Qian, J., Wang, Q., Dose, M., Pruett, N., Kieffer-Kwon, K.R., Resch, W., Liang, G., Tang, Z., Mathé, E., and Benner, C. (2014). B cell super-enhancers and regulatory clusters recruit AID tumorigenic activity. Cell. 159, 1524-1537. Schaukowitch, K., Joo, J.Y., Liu, X., Watts, J.K., Martinez, C., and Kim, T.K. (2014). Enhancer RNA facilitates NELF release from immediate early genes. Mol Cell. 56, 29-42. Schmidt, S.F., Larsen, B.D., Loft, A., Nielsen, R., Madsen, J.G., and Mandrup, S. (2015). Acute TNF-induced repression of cell identity genes is mediated by NFkappaB-directed redistribution of cofactors from super-enhancers. Genome Res. 25, 1281-1294. Shibayama, Y., Fanucchi, S., Magagula, L., and Mhlanga, M.M. (2014). lncRNA and gene looping: what’s the connection?. Transcription. 5, e28658. Shin, H.Y., Willi, M., Yoo, K.H., Zeng, X., Wang, C., Metser, G., and Hennighausen, L. (2016). Hierarchy within the mammary STAT5-driven Wap super-enhancer. Nat Genet. 48, 904-911. Shlyueva, D., Stampfel, G., and Stark, A. (2014). Transcriptional enhancers: from properties to genome-wide predictions. Nat Rev Genet. 15, 272-286. Shou, Y., Martelli, M.L., Gabrea, A., Qi, Y., Brents, L.A., Roschke, A., Dewald, G., Kirsch, I.R., Bergsagel, P.L., and Kuehl, W.M. (2000). Diverse karyotypic abnormalities of the c-myc locus associated with c-myc dysregulation and tumor progression in multiple myeloma. Proc Natl Acad Sci USA. 97, 228-233. Siersbaek, R., Rabiee, A., Nielsen, R., Sidoli, S., Traynor, S., Loft, A., La Cour Poulsen, L., Rogowska-Wrzesinska, A., Jensen, O.N., and Mandrup, S. (2014). Transcription factor cooperativity in early adipogenic hotspots and super-enhancers. Cell Rep. 7, 1443-1455. Steg, A.D., Bevis, K.S., Katre, A.A., Ziebarth, A., Dobbin, Z.C., Alvarez, R.D., Zhang, K., Conner, M., and Landen, C.N. (2012). Stem cell pathways contribute to clinical chemoresistance in ovarian cancer. Clin Cancer Res. 18, 869-881. Teppo, S., Laukkanen, S., Liuksiala, T., Nordlund, J., Oittinen, M., Teittinen, K., Grönroos, T., St-Onge, P., Sinnett, D., and Syvänen, A.C. (2016). Genome-wide repression of eRNA and target gene loci by the ETV6-RUNX1 fusion in acute leukemia. Genome Res. 26, 1468-1477. Vahedi, G., Laukkanen, S., Liuksiala, T., Nordlund, J., Oittinen, M., Teittinen, K., Grönroos, T., St-Onge, P., Sinnett, D., and Syvänen, A.C. (2015). Super-enhancers delineate disease-associated regulatory nodes in T cells. Nature. 520, 558-562.
van der Steen, T., Tindall, D.J., and Huang, H. (2013). Posttranslational modification of the androgen receptor in prostate cancer. Int J Mol Sci. 14, 14833-14859. Wei, Y., Zhang, S., Shang, S., Zhang, B., Li, S., Wang, X., Wang, F., Su, J., Wu, Q., and Liu, H. (2016). SEA: a super-enhancer archive. Nucleic Acids Res. 44, D172-179. Whyte, W.A., Orlando, D.A., Hnisz, D., Abraham, B.J., Lin, C.Y., Kagey, M.H., Rahl, P.B., Lee, T.I., and Young, R.A. (2013). Master transcription factors and mediator establish super-enhancers at key cell identity genes. Cell. 153, 307-319. Willi, M., Yoo, K.H., Wang, C., Trajanoski, Z., and Hennighausen, L. (2016). Differential cytokine sensitivities of STAT5-dependent enhancers rely on Stat5 autoregulation. Nucleic Acids Res. 44, 10277-10291. Wu, H., Nord, A.S., Akiyama, J.A., Shoukry, M., Afzal, V., Rubin, E.M., Pennacchio, L.A., and Visel, A. (2014). Tissue-specific RNA expression marks distant-acting developmental enhancers. PLoS Genet. 10, e1004610. Yokoyama, Y., Zhu, H., Lee, J.H., Kossenkov, A.V., Wu, S.Y., Wickramasinghe, J.M., Yin, X., Palozola, K.C., Gardini, A., and Showe, L.C. (2016). BET inhibitors suppress ALDH activity by targeting ALDH1A1 super-enhancer in ovarian cancer. Cancer Res. 76, 6320-6330. Zhang, S., Li, Y., Wu, Y., Shi, K., Bing, L., and Hao, J. (2012). Wnt/beta-catenin signaling pathway upregulates c-Myc expression to promote cell proliferation of P19 teratocarcinoma cells. Anat Rec (Hoboken). 295, 2104-2113. Zhao, J., Zhao, Y., Wang, L., Zhang, J., Karnes, R.J., Kohli, M., Wang, G., and Huang, H. (2016). Alterations of androgen receptor-regulated enhancer RNAs (eRNAs) contribute to enzalutamide resistance in castration-resistant prostate cancer. Oncotarget. 7, 38551-38565. Zhao, Y., Wang, L., Ren, S., Wang, L., Blackburn, P.R., McNulty, M.S., Gao, X., Qiao, M., Vessella, R.L., and Kohli, M. (2016). Activation of P-TEFb by androgen receptor-regulated enhancer RNAs in castration-resistant prostate cancer. Cell Rep. 15, 599-610.